Wholegrain Stone Ground Corn (64%), Canola Oil, Aged Cheddar Cheese Seasoning (7%), [Maltodextrin, Salt, Natural Flavour, Cheddar Cheese Powder (Contains Milk) (10%), Whey Protein (Contains Milk), Dextrose, Mineral Salt (Potassium Chloride), Yeast Extract], Linseed (5%), Cauliflower Powder (2%). More than 80% lower in saturated fat. Wholegrain Stone Ground Corn (62%), Canola Oil, Roasted Garlic Parmesan Seasoning (7%), [Maltodextrin, Milk Solid (Contains Milk), Salt, Natural Flavour, Sugar, Parmesan Cheese Powder (5%) (Contains Milk), Yeast Extract, Vegetable Powder (Garlic (2%), Onion), Acidity regulators (Sodium acetate, Citric Acid)], Lentils (5%), Mushroom Powder (4%). Chickpea Pellets (71%) [Chickpea Flour, Par- Boiled Rice, Potato Starch, Corn Flour, Pre-Gelatinised Potato Starch, Salt], Vegetable Oil (Canola/Sunflower), Hommus Seasoning (5%) [Chickpea Flour (40%), Cream Powder (Contains Milk), Herbs & Spices, Garlic Powder (5%), Salt, Citric Acid, Natural Flavour]. More than 70% lower in saturated fat. Lentil Twists (Lentil Flour (48%), Potato Flour, Potato Starch, Salt), Canola Oil, Harissa Flavour Seasoning (7%) [Maltodextrin, Sugar, Spices (Paprika, Red Chilli (8%), Coriander (1.5%), Cumin), Salt, Vegetable Powder(Garlic, Onion), Natural Flavour, Citric Acid, Sunflower Oil]. More than 85% lower in saturated fat. Quinoa Chia Straws (65%) [Quinoa Flour (25%), Wholegrain Corn Flour, White Rice Flour, Brown Rice Flour, Chia Seeds (5%), Salt], Canola Oil, Wasabi Seasoning (5%), [Rice Flour, Sugar, Yeast Extract, Salt, Natural Flavour, Spice and Herbs, Onion Powder, Wasabi Powder (18%), Vegetable Oil]. Whole Grain Stone Ground Corn, Vegetable Oil (Canola / Sunflower), Falafel Seasoning (6%) (Herbs and Spices, Vegetable Powders, Tomato Powder, Natural Flavour, Salt, Natural Colour [Paprika Oleoresin]), Chickpea Flour (1.5%), Bean Flour, Sea Salt. Whole Grain Stone Ground Corn, Vegetable Oil (Canola / Sunflower), Falafel Chilli Seasoning (7%) [Herbs and Spices (Chilli (3%)), Vegetable Powders, Tomato Powder, Natural Flavour, Salt, Citric Acid, Natural Chilli Extract), Chickpea Flour (2%), Sea Salt. 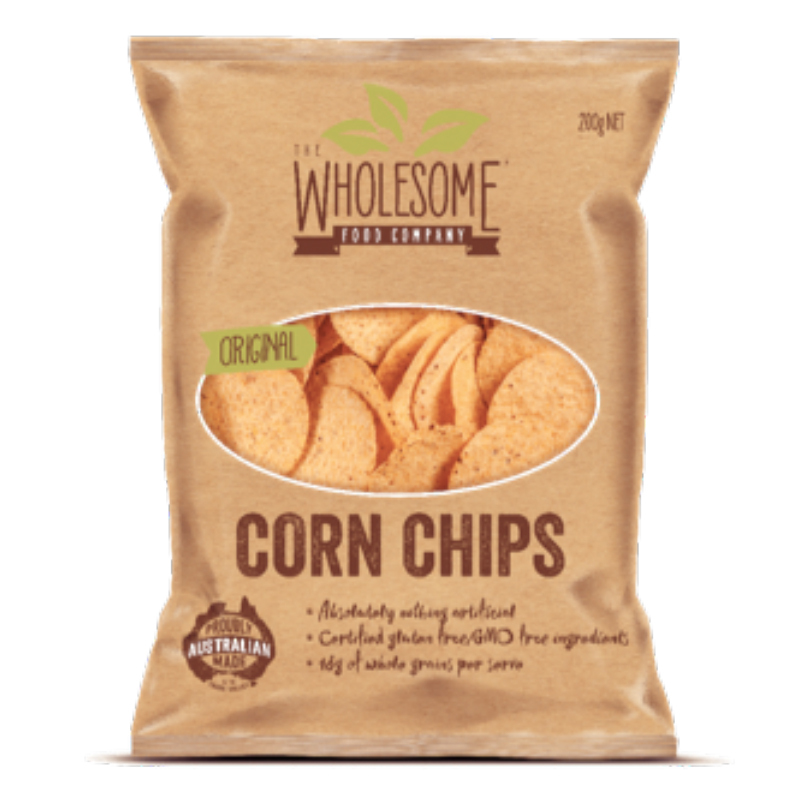 Wholegrain Stone Ground Corn (72%), Vegetable Oil (Canola / Sunflower), Sea Salt. Wholegrain Stone Ground Corn (74%), Vegetable Oil (Canola/Sunflower), Spicy Chilli Seasoning 5% [Glucose, Salt, Sugar, Tomato Powders, Natural Flavouring, Spices (Chilli, Cumin), Garlic Powder, Onion Powder, Food Acid (Malic Acid), Starch (Corn), Paprika Oleoresin]. Wholegrain Stone Ground Corn (74%), Vegetable Oil (Canola / Sunflower), Cheese Flavour (5%) [Whey Powder (Contains Milk), Salt, Lactose (Contains Milk), Vegetable Powders, Sugar, Yeast Extract, Natural Flavour (Contains Milk), Natural Colour (Paprika Oleoresin), Food Acid (Malic Acid), Organic Cheese Flavour, Spice and Spice Extract]. White Bean pellets (77%) [White Bean Flour (25%), Potato Starch, Pea Protein (20%), Potato Flakes, Potato Fibre, Salt], Vegetable Oil (Sunflower/Canola oil), Apple Cinnamon Seasoning (7%) [Sugar, Maltodextrin (from maize), Sea Salt, Spices (8%) (Cinnamon, Pimento), Apple Powder (4%), Molasses, Natural Apple Flavour]. Does not contain any artificial colours, flavours, additives, preservatives, genetically modified ingredients or added MSG. Gluten free. Made in a nut free facility. White Bean Pellets (76%) [White Bean Flour, Potato Starch, Pea Protein(23%), Potato Flour, Potato Fibre, Salt], Vegetable Oil (Sunflower/Canola Oil), Fire Roasted Jalapeno Chilli Seasoning (7%) [Rice Flour, Spices and Herbs (Jalapeno (1%), Chilli (2%)), Salt, Sugar, Smoked Salt, Vegetable Powder (Garlic, Onion), Tomato Powder, Natural Flavour, Yeast Extract, Sunflower Oil.